Picture “Ukrainian art” and you might think of embroidered dresses, traditional pottery or even decorated Easter eggs. But a jewel of a museum in Chicago’s Ukrainian Village has emphasized contemporary art for more than 40 years. 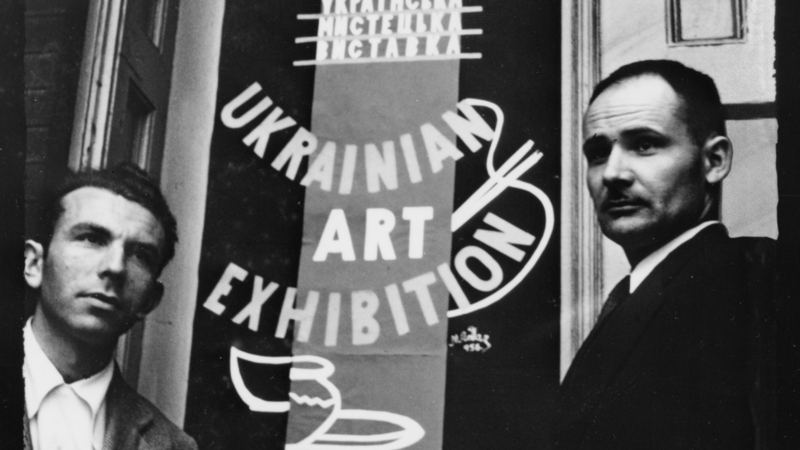 We visit the Ukrainian Institute of Modern Art for a look at its past – and future. Phil Ponce: Founded in 1971, the Ukrainian Institute of Modern Art now resides behind a façade designed by Chicago architect Stanley Tigerman. Inside, a new exhibition looks at the art and legacy of the founding fathers of the museum. There are kinetic sculptures, set in motion with a gentle touch. There are imposing oil paintings and there are works that are just plain playful. The artwork represents the fierce creativity of a colorful group of characters. Elena Smolynets, Ukrainian Institute of Modern Art: Not many people know that Ukraine has produced so many talented people, especially in art, and they were not just as people would call “classical art” but also modernist and experimentalist, and so they actually wanted to show that Ukrainians are very diverse and very different and very creative. They wanted to show that they also had their own talents, abilities, and they’re not afraid to show it. Ponce: “They” were founders Konstantin Milonadis and Mychajlo Urban, a pair of Ukrainian-born artists and friends who served in the U.S. Army and used the GI Bill to attend the School of the Art Institute. They founded the museum with the help of a family doctor dedicated to art. Smolynets: At the very beginning these two artists -- they did a colossal work organizing little exhibits here and there, reaching out to young artists, first of Ukrainian roots. And we represent, for more than 46 years, artists of all roots and backgrounds. Nobody’s checking on DNA, it’s all about art, so the Ukrainian Institute of Modern Art is teaching about experimental, innovative forms of art in all medias. Ponce: The founders may have been non-traditionalist, but they still had the faith of the community. It was modern and contemporary and experimental in a way. But a lot of these people from the community, these prominent people who had stable, steady jobs: engineers, doctors, medics -- they wanted to support them even though sometimes they didn’t understand or they didn’t agree with certain things. Ponce: Also on view: woodcuts that probably would not offend a staunch traditionalist and a historic work by the noted avant-garde artist Alexander Archipenko, who exhibited his artwork in the Ukrainian Pavilion at the Century of Progress World’s Fair. Smolynets: We’re well recognized for our permanent collection. It’s impossible to show everything what we have. And its largest collection in U.S. and maybe in the world of artists of Ukrainian roots. More on this story: The Ukrainian Institute of Modern Art is a member of the Chicago Cultural Alliance. The exhibition is called “Lions” and runs through Sept. 30. Note: This story first aired on Aug. 7, 2018.